Entry Fee: $10 ($15 for non-RUSA members). Checks should be payable to "Oregon Randonneurs", also, Oregon Randonneurs membership is required for this event. You can download a membership form and bring it with you. Register Now! Medals: ACP brevet medals will not be sold. You will be able to purchase these directly from RUSA. Yes, lights, leg bands and vest/sash are required! 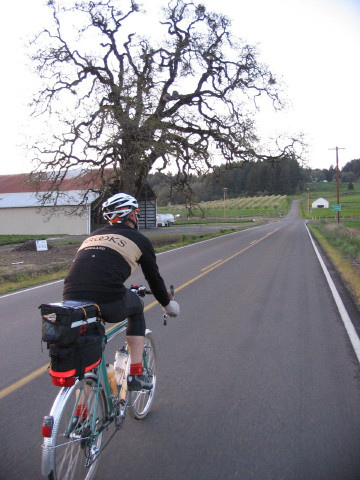 This brevet starts at a new favorite location, Grand Lodge in Forest Grove. Several folks made it clear that this was a great place to start and end a brevet. The route heads west along Gales Creek, then up Timber Rd several miles before turning around at an informational control. Returning to Wilson River Hwy, ride over Wilson River Summit (elev. 1586) through the Tillamook Forest on Hwy 6 to Tillamook. From Tillamook, you ride around the south end of Tillamook Bay on the scenic Three Capes Coastal Bicycle route. 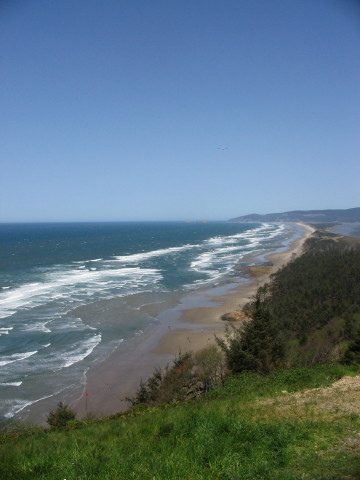 First, you climb Cape Meares. On a clear day you can catch glimpses of Bayocean below. Then, you ride up and down a few times passing near Oceanside and then down to Netarts, the first control location. The route then heads along Netarts Bay, passes Cape Lookout State Park and up over Cape Lookout which has the steepest sections of climbing on the route. Approximately halfway up is a viewpoint, the perfect spot to catch your breath and take in the view. After reaching the top of Cape Lookout, it is a steep and fast decent to the Sandlake Dunes. Watch for cracks in the pavement on this downhill. At Sandlake, there is a small store, a grange and many dune vehicles on a nice weekend. The route travels inland a bit as you continue your way south toward the third of the three capes, Cape Kiwanda, which is neither steep nor high. After Cape Kiwanda, you enter the Pacific City area, with a brewery on the right, and a great coffee shop on the left. 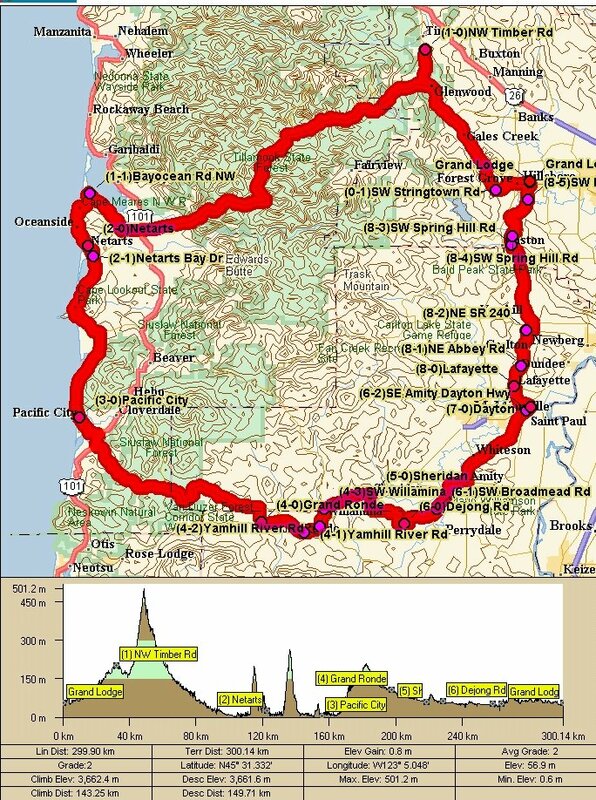 Zigzag through Pacific City and ride along the Nehalem Bay back to Hwy 101. After a short distance, you head inland and along one of the quietest and best sections of the route, the Little Nestucca to Sourgrass Summit (elev. 672). After crossing the Coast Range you head for Grand Ronde. The Spirit Mountain Casino is a good place to stop if you need services. It is usually in this location that riders notice one terrific tailwind coming in off the ocean. Sit up and enjoy it. Next, the route meanders along the Yamhill River then to Willamina, Sheridan and Ballaton before heading towards Amity and the Eola Hills. Next, head north skirting several vineyards and wetlands back to Forest Grove. What to do after the ride? If you finish before 11PM, you can use the soaking pool. Bring a suit and towel then exchange your driver's license for a key to the pool at the front desk. If you eat at the Grand Lodge, you can use the pool for free, otherwise it is $5. You can get something to eat (& drink!) until 11PM at the Ironwork Grill, 2AM in the Doctor's Office Bar. Grand Lodge also has several common rooms. We usually set up snacks, drinks and such in the Rounder Room where you can relax after the finish. There are comfy couches, chairs, a rocker and a fireplace. Cumulative elevation gain is estimated at 7000 feet. Jason Penny and Lynne Fitzsimmons provide a "he said/she said" pair of stories. Ever observant Nate Armburst posted photos to his flickr space. Cecil (who claims to have the view from the end of the pack) has both story and pictures. A sizzling quick ride story is related by Craig Sinanian. In the really fast lane Del 'getting better with age' Scharffenberg finished in just 11 hours. His report shows the focus and concentration on matters at hand needed to perform that well. Chuck of Coho cycles blogged for SIR about "the event more than a ride." Sal Ortega photos look nice. Joel Metz historian and bike messanger brings some perspecitve to our brevet. With an ominous forecast, 58 riders clicked in and began the ORR 300K route from the Grand Lodge in Forest Grove yesterday at 6am. After an initial gloom, the day became truly spectacular with temps and sunshine forcing clothes changes in Netarts and earlier. Even the control workers in Netarts found the weather almost uncomfortably warm. By dusk, the weather cooled but the day remained mostly clear with an occasion shower to remind us that we do live in the NW after all. The ride provided perks and challenges for all. Beautify scenery, just enough climbing to make the descents fun and fast, smooth flats for tailwind-assisted, high-speed valley runs. Susan's' modifications to her original design removed the unpleasant bits from last year's route and provided the riders with an opportunity to answer that ever popular question, "What is the name of the defunct general store in Ballston." For those of you who rode, go ahead, impress your friends with your new found knowledge. For those of you who missed the ride, that info will have to wait until next year.